Princess Elisabeth of Anhalt was born on 7 September 1857 at the Wörlitz Palace, near Dessau, the daughter of the then Hereditary Prince Friedrich of Anhalt and his wife the Hereditary Princess Antoinette. 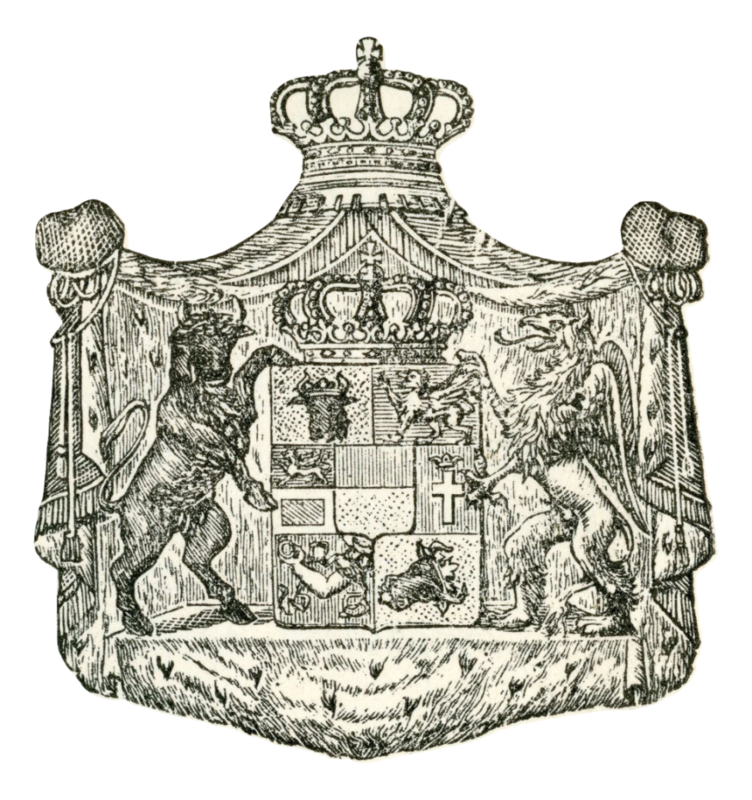 Princess Elisabeth was christened into the Lutheran faith with the names Elisabeth Marie Friederike Amalie Agnes at the Wörlitz Church on 1 October 1857. The date also marked the 63rd birthday of her grandfather Duke Leopold IV of Anhalt who was named as a godparent along with his daughter the Duchess Agnes of Saxe-Altenburg, his brother Prince Wilhelm of Anhalt, the Queen Elisabeth Luise of Prussia and the Queen Marie of Bavaria. Being the eldest daughter in her family, Princess Elisabeth also had two elder brothers; the future Hereditary Prince Leopold; born 1855 and the future Duke Friedrich II; born 1856. Her younger siblings were the future Duke Eduard; born 1861, Prince Aribert; born 1864 and Alexandra the future Princess of Schwarzburg; born 1868. Princess Elisabeth was educated by the hereditary princely family court’s tutor Dr Wilhelm Hofäus and governess Mathilde von Zeschau. She spent her childhood at the Hereditary Princely Palais in Anhalt’s capital Dessau, the summer months were spent at the Wörlitz Palace. In 1871 Princess Elisabeth’s father succeeded to the throne as Duke Friedrich I of Anhalt and in 1874 the family moved into the main Residence Palace in Dessau. 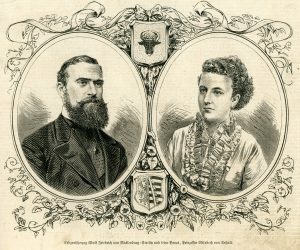 In early 1876 Princess Elisabeth met the Hereditary Grand Duke Adolf Friedrich of Mecklenburg-Strelitz during one of his stopovers in Germany while travelling to Italy. They met again later that year during the Hereditary Grand Duke’s visit to his cousin Princess Marie of Anhalt and her daughter Princess Hilda. It was during this visit that on 29 December Princess Elisabeth accepted the Hereditary Grand Duke’s marriage proposal. The couple were married the following year on 17 April 1877 at the Dessau Palace, honeymooning at Lake Geneva in Switzerland. The new Hereditary Grand Duchess Elisabeth arrived in Neustrelitz on 7 July setting up home with her husband in the Carolinenpalais in Neustrelitz. The couple also maintained a summer residence at the Prillwitz Hunting Palace where the Hereditary Grand Duchess Elisabeth became closely involved with the local community and showed her charitable nature by gifting an organ to the local church. 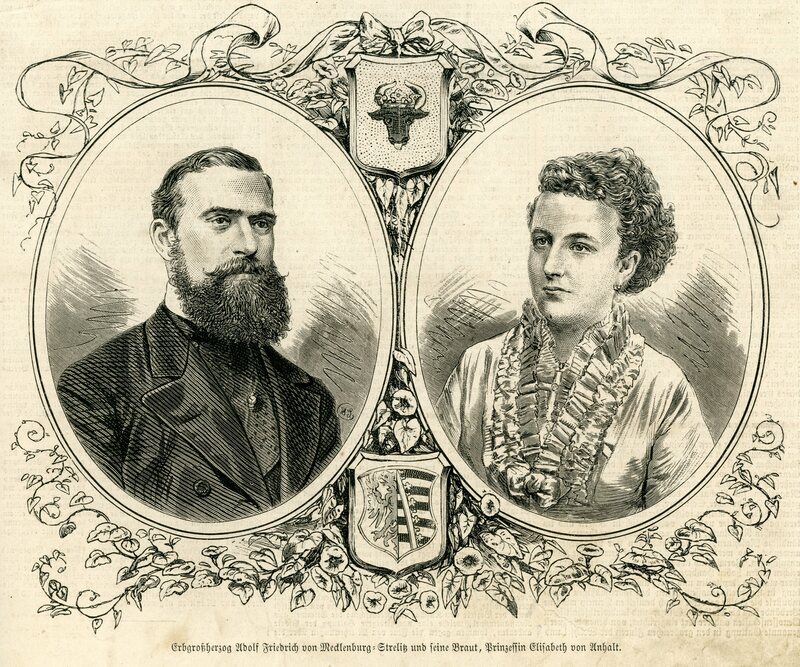 Beginning with Duchess Marie in 1878, the hereditary grand ducal couple would go onto have four children. A second daughter Duchess Jutta, born 1880, was followed by two sons, Hereditary Prince Adolf Friedrich, born 1882 and Duke Carl Borwin, born 1888. In her public role the Hereditary Grand Duchess Elisabeth participated in events within Mecklenburg-Strelitz and elsewhere, travelling to royal events in places such as Great Britain where the grand ducal family had close family ties. In private she remained close to her paternal family in Anhalt making regular visits with her children to her parents and other relatives. At home in Mecklenburg-Strelitz she had a close relationship with her parents in law the Grand Duke Friedrich Wilhelm and the Grand Duchess Augusta, the latter with whom she shared an interest in art and music and hosted house concerts with. The year 1904 got off to a sad start for Hereditary Grand Duchess Elisabeth with the death of her father Duke Friedrich I of Anhalt on 24 January. Just four months later she became the Grand Duchess of Mecklenburg-Strelitz with the death on 30 May of her father in law Grand Duke Friedrich Wilhelm. As Grand Duchess, Elisabeth succeeded her mother in law as patron of various charitable organisations within the state. Away from her public role the Grand Duchess Elisabeth was interested in nature and flowers. But where she could use her public profile to support causes of interest to her she did so, becoming an honorary member of the Association for the Protection of Birds. Just as in 1904, Grand Duchess Elisabeth would suffer another series of bereavements four years later. In August 1908 her youngest child Duke Carl Borwin died unexpectedly while two months later she was mourning her mother the Dowager Duchess Antoinette of Anhalt. 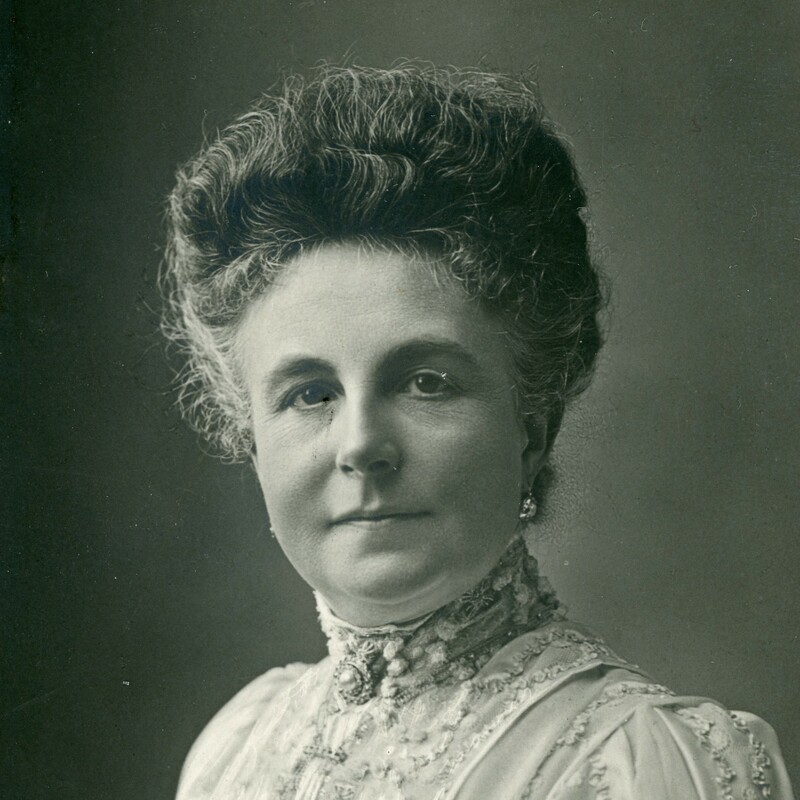 Grand Duchess Elisabeth used the tragedy of losing her youngest child to aid others as in 1910 in memory of her son she established the Duke Carl Borwin Memorial Home in Neustrelitz primarily to provide a home to orphans and other children in need. In 1914 the Grand Duchess Elisabeth was widowed with the death of her husband Grand Duke Adolf Friedrich V. However as her son the new Grand Duke Adolf Friedrich VI was unmarried she remained the first lady of Mecklenburg-Strelitz. During the Fist World War, which broke out soon after her husband’s death, Grand Duchess Elisabeth supported the war effort through her devotion to charitable causes, by supporting Red Cross initiatives, concerning herself with the welfare of soldiers’ families and donating food to local soup kitchens. The year 1918 would turn out to be another difficult one for Grand Duchess Elisabeth. In February she was mourning the loss of her son Grand Duke Adolf Friedrich VI. This was soon followed by the death of her brother Duke Friedrich II of Anhalt in April then by her next brother Duke Eduard of Anhalt in September. 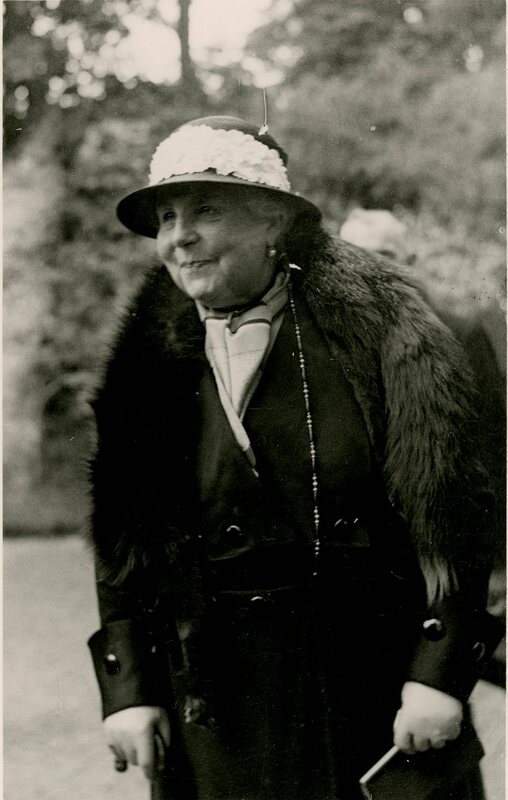 Following the end of the monarchy in November 1918 the Grand Duchess Elisabeth remained in Neustrelitz moving into the Park House which she had inherited from her son. The main Neustrelitz Palace was among the properties expropriated by the new republican government who Grand Duchess Elisabeth pursued compensation claims against. Although initially settled, due to the unforeseen hyper inflation in Germany the compensation quickly devalued necessitating her to pursue further claims. Grand Duchess Elisabeth spent the rest of her life in Neustrelitz where she would from time to time receive visits from her daughters and grandchildren and spend her time gardening and reading. 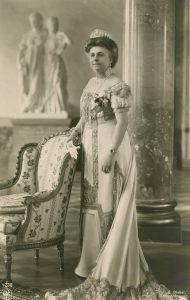 Although she no longer held an official role in the state, Grand Duchess Elisabeth remained active in Mecklenburg-Strelitz right up to her death having retained her position as patron of a number of charitable organisations. The day before her death she was at the Hohenziertz Palace to participate in a ceremony to commemorate the death of Queen Luise of Prussia, born Duchess of Mecklenburg-Strelitz. Grand Duchess Elisabeth died on 20 July 1933 in Neustrelitz. Her funeral was held on 25 July in Neustrelitz, after which she was interned in the family crypt in the Church of St John in Mirow alongside her husband.